Mouse anti Human CD63 antibody, clone MEM-259 (MCA2142)used for the evaluation of CD63 expression on SH-SY5Y cells by immunofluorescence. Fragmented fibrils of β2m increase the cell surface expression of LAMP-1 and CD63. SH-SY5Y cells were incubated with 1.2 μm (monomer-equivalent concentration) fragmented β2m fibrils or β2m monomers for 2 and 24 h. A, cells were fixed, permeabilized, and stained with LAMP1 and CD63 antibodies. Antibody staining was detected with fluorescently labeled secondary antibodies. Cell-associated fluorescence was visualized by confocal microscopy. In the merged images, images of antibody staining were combined with phase-contrast images. Yellow indicates colocalization of CD63 (green) and LAMP-1 (red). B, cell lysates were analyzed by immunoblotting with CD63-, LAMP-1-, and GAPDH-specific antibodies. Scale bar = 10 μm. 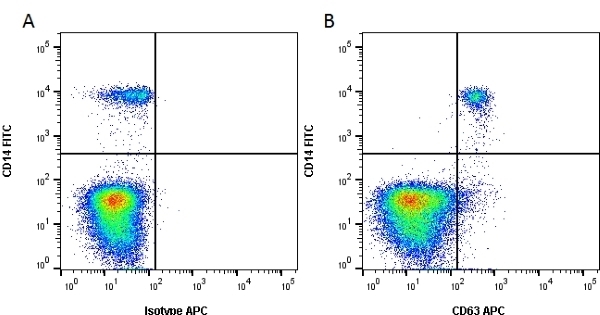 C, cell surface expression of LAMP-1 and CD63 was quantified by flow cytometry and is expressed as a percentage of that of cells incubated for 0 h in the presence of β2m samples. Error bars indicate mean ± 1 S.E. over a total of nine replicates. *, p<005; **, p<0.01. D, SH-SY5Y cells were preincubated for 1 h in the presence or absence of cycloheximide and then incubated with fragmented β2m fibrils for 2 h. Cells were then stained with LAMP-1- and CD63-specific antibodies, and antibody fluorescence was quantified by flow cytometry. From: Jakhria T, Hellewell AL, Porter MY, Jackson MP, Tipping KW, Xue WF, Radford SE, Hewitt EW. β2-microglobulin amyloid fibrils are nanoparticles that disrupt lysosomal membrane protein trafficking and inhibit protein degradation by lysosomes. J Biol Chem. 2014 Dec 26;289(52):35781-94. Mouse anti Human CD63 antibody, clone MEM-259 recognizes the CD63 cell surface antigen, also known as granulophysin, lysozomal associated membrane protein 3 (LAMP-3), Melanoma-associated antigen ME491, Ocular melanoma-associated antigen or tetraspanin-30. CD63 is a 238 amino acid, tetraspanin glycoprotein of ~40-60 kDa. CD63 is expressed by monocytes, macrophages, endothelial cells where it is a component of Weibel-Palade bodies (Vischer et al. 1993) and by a variety of cell lines. It is located intracellularly in lysosomal granules of platelets, being translocated to the surface upon activation. It may therefore by useful as a marker of platelet activation (Hamamoto et al. 1994). CD63 expression is also associated with melanoma development (Radford et al. 1997) and expression is rapidly down-regulated by progesterone in endometrial tissues (Okada et al. 1999). Durand-Panteix, S. et al. (2012) B7-H1, which represses EBV-immortalized B cell killing by autologous T and NK cells, is oppositely regulated by c-Myc and EBV latency III program at both mRNA and secretory lysosome levels. J Immunol. 189 (1): 181-90. Abdel-Latif, D. et al. (2004) Rac2 is critical for neutrophil primary granule exocytosis. Norling, L.V. et al. (2012) Resolvin D1 limits polymorphonuclear leukocyte recruitment to inflammatory loci: receptor-dependent actions. Arterioscler Thromb Vasc Biol. 32 (8): 1970-8. McKechnie, N.M. et al. (2006) Fas-ligand is stored in secretory lysosomes of ocular barrier epithelia and released with microvesicles. Exp Eye Res. 83: 304-14. Spring, F.A. et al. 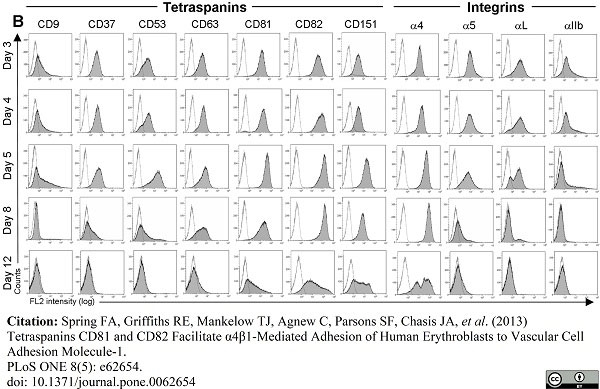 (2013) Tetraspanins CD81 and CD82 facilitate α4β1-mediated adhesion of human erythroblasts to vascular cell adhesion molecule-1. Pliyev, B.K. (2008) Activated human neutrophils rapidly release the chemotactically active D2D3 form of the urokinase-type plasminogen activator receptor (uPAR/CD87). Mol Cell Biochem. 321: 111-22. Suraeva, N.M. et al. (2015) Changes in the Morphological and Immunological Characteristics of Mel Ibr Melanoma Cells in Response to Chicken Embryo Extract. Bull Exp Biol Med. 159 (4): 520-3. Schäfer, T. et al. (2010) A granular variant of CD63 is a regulator of repeated human mast cell degranulation. Jakhria, T. et al. (2014) β2-microglobulin amyloid fibrils are nanoparticles that disrupt lysosomal membrane protein trafficking and inhibit protein degradation by lysosomes. J Biol Chem. 289 (52): 35781-94. Ethier, C. et al. (2016) Calcitriol Reduces Eosinophil Necrosis Which Leads to the Diminished Release of Cytotoxic Granules. Int Arch Allergy Immunol. 171 (2): 119-29.